VMware VSAN 6.5 has been announced! During VMworld US there wasn’t any vSphere 6.5 information coming out. I mean, we were expecting the vSphere 6.5 to come out one day or another, but the information could only be shared today. Here we go. 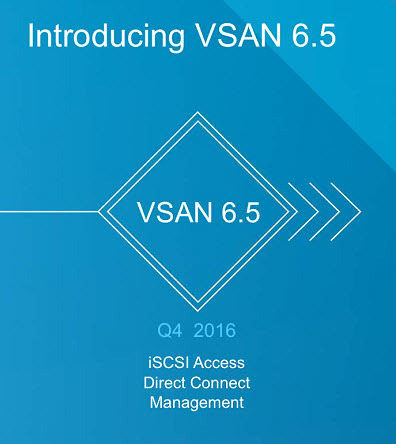 VSAN 6.5 is the 5th generation of VSAN! 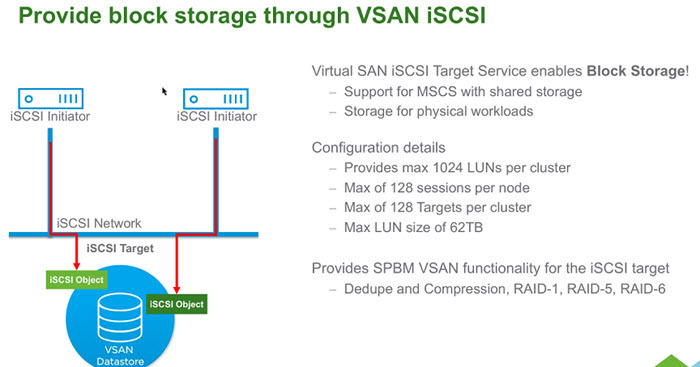 The 6.5 release of VSAN brings iSCSI, 2-Nodes Direct-connect or enhancement on the management side. Also, there is one change on the licensing side where All-flash hardware supports now available on VSAN Standard, along with Advanced and Enterprise. So you’ll get up to 50% TCO savings for basic all-flash configurations. However, the dedupe, compression, and erasure coding are still part of the Advanced and Enterprise. VSAN direct-connect was discussed before, and we have even created a blog post about that. At that time, the information which we had to work with, did not appear to be true, so the post was changed into a UNSUPPORTED. Good news today, I’ll be able to re-change the blog post again to reflect the new reality – VMware VSAN supports 2-Nodes Direct-Connect! SUPPORTED…-:) It is a very good news for smaller customers or for customers with ROBO environments as those deployments will become a little bit cheaper – not requiring 10GbE switches. Let’s get started. The 2-node direct connect wasn’t new as an idea and this was here since the early days of VSAN. The challenge was to make it work with single VMkernel port. The thing was that it wasn’t possible to have a witness traffic and VSAN traffic through the same VMkernel port. So there was a necessity to separate that traffic, via another VMkernel port for the witness traffic. You can basically save an additional 20 % on cost by avoiding to buy a 10GbE switch for ROBO offices. The two nodes are connected via two crossover cables. The cost and complexity is a problem for ROBO sites. The direct-connect takes off the complexity, (no need to configure switches, VLANS) and also cost. The simplicity of Direct-connect solution is exemplary. You can also enable this kind of configuration for stretched clusters configuration as well. Note: VMotion will also work with direct-connection! The witness traffic isolation. This traffic separation is focused on helping with the security and configurations for 2-node environments (1 host+1 host+1 witness). It will not be supported for stretched cluster configurations with multiple hosts in a single fault domain in a site. There is this a new iSCSI support within VSAN. Yes, block storage within VSAN. Note that this is in-kernel solution (not VSA). 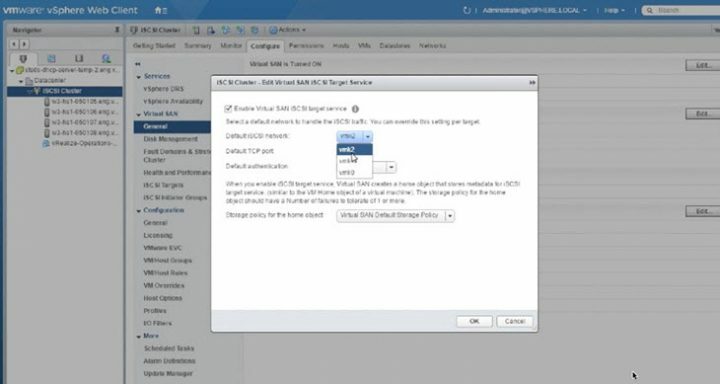 The demo video we’ve seen from John Nicholson explained the activation of the iSCSI on particular vmkernel port, the system configures the iSCSI vmkernel port on every host within the VSAN cluster. CHAP for authentication is supported as well. You can create an Alias, you can have multiple vmkernel ports for multiple targets, you can apply a policy and size. The maximum size is 62 TB. (maximum of VMDK). All the options can be handled via UI (web) or via PowerCLI. Good stuff..
Activation of iSCSI within your cluster (Note that this image will get replaced by a better copy, later, when I’ll get back from my travels). You now can deploy and use All Flash (AF) version of vSAN not only on Enterprise and Advanced but also on Standard. VMware Licensing has changed, so additional TCO savings here!!!! VMware has done a very good job with the VSAN 6.5. Plus the All Flash news is really good as Flash is the future NOW !! 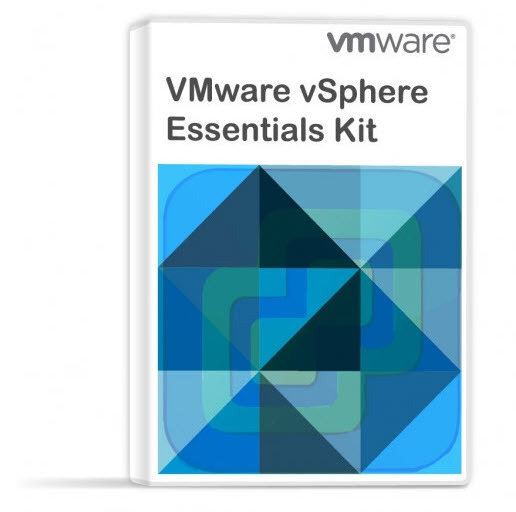 Check our VMware vSphere 6.5 Page for ALL details about new announces and releases. Great article, VSAN 6.5 is the 5th generation of VSAN and it is really a great that now VMware VSAN supports 2-Nodes Direct-Connect. This will be a very helpful for smaller customers or for customers with ROBO environments . These deployments will become a little bit cheaper. The good thing is that all-flash hardware supports now available on VSAN Standard.New iSCSI support within VSAN is also new feature of this VSAN . Thanks once again to share this great article with us.